We have had the same project sent to us 9 times now...we figured it was past time to check this one out and do some testing. I'll just jump right in...the pictures pretty much speak for themselves. Aimee: "Well I found this yummy recipe for baked cheese bites. In all honesty I just had my 4th baby,and I had my first day back at work to prepare for so I did probably turn my head and 10 mins may have slipped by, lol but not by much." Alaina: "This is clearly a Pinstrosity...I think if I maybe used egg and flour along with milk, they may have held their shape? I even froze the cheese chunks before dipping, cooking etc." Amy: "This recipe sounded super easy and I love cheese! Recipe says... Just dip string cheese chunks in milk, roll in bread crumbs and bake for 8-10 mins. So I tried it. Mine just don't look the same! Haha! They tasted pretty good but, looked like lil cow pies." 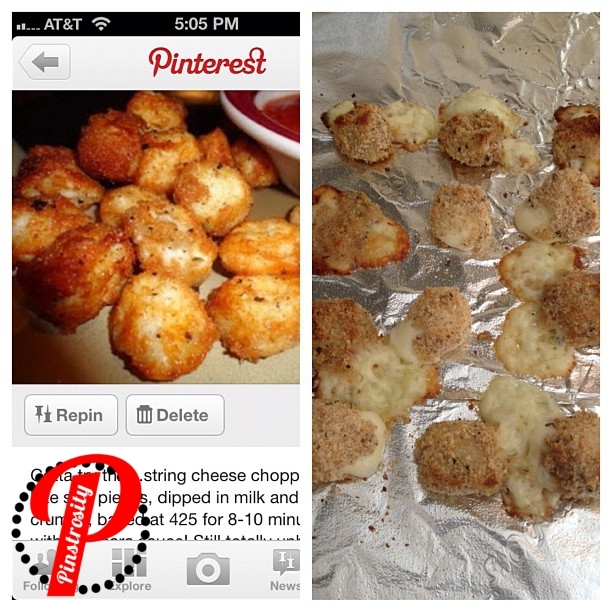 Anahi: "So I saw this Pin for baked cheese balls and it looked delicious! After taking forever to get myself to make them it went horribly wrong! Let's just say it was the epic fail of the day! It says to get string cheese and cut it... I didn't have string cheese so I used a regular bar of pepper jack cheese cut it into squares then made them into little balls. Then it says to dip them in milk ... which I did then to fill them with bred crumbs which I did. Set the oven for 450 and bake for 10 min.. now here is where I got hesitant because it seemed too long for cheese to be under this heat....but I did it anyways...."
Emily: "I followed all the tips on the site but at the end of the day oven is too hot and its finicky." Jennifer: "Not sure what went wrong, but when it was over I felt like I should've seen it turning out badly! lol"
Katie: "I just wanted a quick snack; I think I nailed it." Keith: "I was hungry and wanted to make them. I did not have any mozzarella sticks, but had cubed cut cheddar and colby jack cheese left over from making macaroni and cheese recently. I followed the rest of the recipe (which was pretty vague), and thought it should work. Which leads me to my first epic Pinterest fail." I could feel the disappointment in the emails. What an awesome snack gone awry. I decided to give this one a test to see what I could figure out hands on. First step? Go check out the original post by Abby at http://www.justaddasliceoflove.blogspot.com. 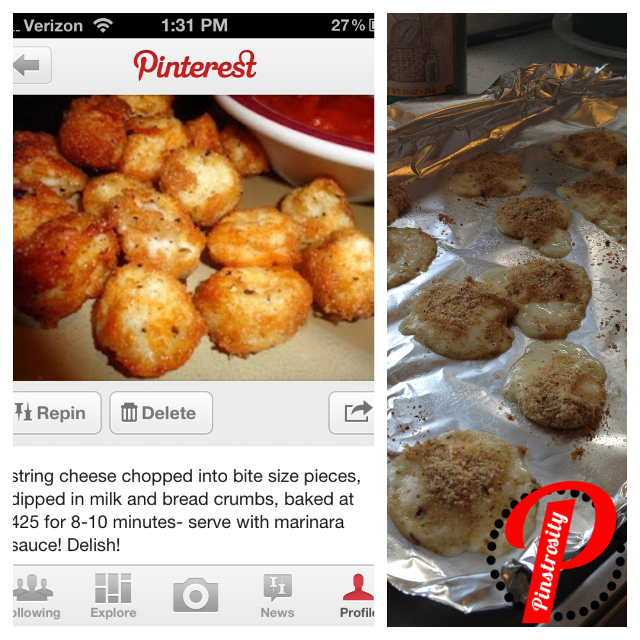 The pin that many people sent us had Abby's photo with these instructions as the pinned caption: "string cheese chopped into bite size pieces, dipped in milk and bread crumbs, baked at 425 for 8-10 minutes- serve with marinara sauce! Delish!". Well, as with many of these "instructive" captions...they were missing some of the details. There's a little more to it than that...not a whole lot, but some. The first thing I saw was that Abby didn't just use plain bread crumbs as her breading. She used Italian Style Bread Crumbs, Parmesan cheese, and seasonings. That is the main part that the pinned instructions were missing. 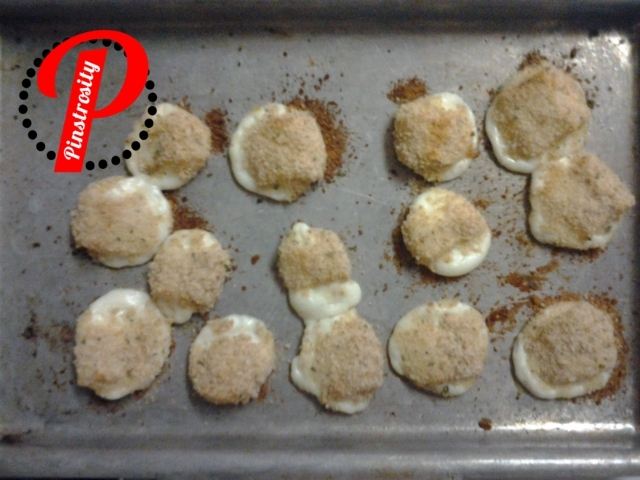 I used bread crumbs for other recipes, so I just got plain ones and added Italian seasoning and onion powder for more flavor. So, as per Abby's instructions, I mixed all the dry ingredients together in a bowl. Next I cut up the cheese sticks, poured some milk in a bowl and dropped the cheese in. One by one I pulled the cheese out, dropped it in the crumbs, and swirled it around to coat the cheese thoroughly. ...so I decided to experiment. With three of the cheese pieces I just did one coat of crumbs, and with 3 of the cheese pieces I re-dipped them in the milk and gave them a 2nd crumb coating. The single dipped are in the triangle in the pan (below) and the double dipped are in the vertical line on the right. The single dipped ones didn't fare as well as the double dipped...but the double dipped ones still didn't do great. So I decided to try again, this time with 3 doubled dipped cheeses and 3 triple dipped cheeses. And, this time I decided to do as Abby did and I stood with the door ajar and watched them bake until I saw the first hints of melting (which was at about 4 minutes). I pulled them out and the cheese was about right this time. The breading wasn't my favorite at this point though because it was still to "raw" and not crispy at all...so I did an extra step. We keep bacon grease in the fridge, so I pulled that out and melted a glop (which is a very precise measurement) in our pan. I then used my most awesome pig tongs to fry up the cheese balls. I'm not left-handed actually...I just had to hold the tongs in my left hand so I could hold the camera in my right hand...I'd rather drop the tongs than the camera). I fried one a little too long (the one in back), but the rest were just about perfect. I pulled our our leftover pizza sauce and had me a nice little snack. After fixing these up I think that the main problem that everyone had was that they read the instructions as "Bake for 10 minutes" but Abby's exact words are "I actually don't know how long I baked them because I watched them the whole time thinking they were going to cheesily explode in the oven because how could the cheese not just melt instead of staying in between the teeniest layer of breading that I could barely see after I put them on the greased baking sheet? I would say 10 minutes or less". 2 minutes with a closed oven door or 4 with an open oven door worked perfect for me. Before you stick a whole pan full of these buddies in, test one or two to see what the right time is for your oven. Start with 2 minutes and go from there. I have made this before successfully. Freeze the cheese for at least 8 hours before you attempt. After you bread the cheese freeze it again. The key is that the cheese will hold its shape better if frozen and baked for less than 4 min. Just watch it carefully. Good luck! I read some other comments from the author and she said she used low or no fat string cheese, (and froze it before cooking)which held up a whole lot better than regular string cheese. I have this one pinned but have been hesitant to try it. I was going to suggest freezing but somebody beat me to it! The other thing is to spraying w/a bit of cooking spray will help them brown in the oven. thank you so much for doing this one. I have this pinned and was contemplating it, but seeing how all of the volunteer's didn't work so well made me a) laugh (with them not at them) and 2) decide not to try this! Keep the fun coming! Ive made these!!! they totally flattened, but I reshaped them (sort of) by hand and they tasted good =). Freezing it is a good idea. i actually made these last week and was going to send you MY pinstrosity of them! they were so horribly ugly! we managed to scrape them off the baking sheet and eat them, but they were definitely more cheese pancakes with a little bit of breadcrumbs than mozzarella bites! glad i wasnt the only one who didnt fare well with these! Haha! I just found out about your blog because I just posted a pin fail on my blog for this recipe. I'll try the frying next time - baking didn't work. lol. The "raw" breadcrumbs were really icky. I found the secret when i made them was freezing the cheese after cutting into pieces and then after breading (just until solid each time) and then using a toaster oven. The heat was more evenly distributed, heated faster, and it was easier to keep an eye on the to make sure they kept their shape. I used Panko instead of traditional breadcrumbs too and they crisped up nicely! I think it may come down to the differences in cheese. Even brands can have different texture which would affect how they baked up. It may come down to experimenting with different brands, also. Freezing seems to be a over all good idea, too. It's what makes the fried fair monstrosities possible, so why not cheese ball bites? I made these the other night for a party and they held their shape perfectly. But I did freeze them over night and took them right from the freezer and put them in the oven. i made these. 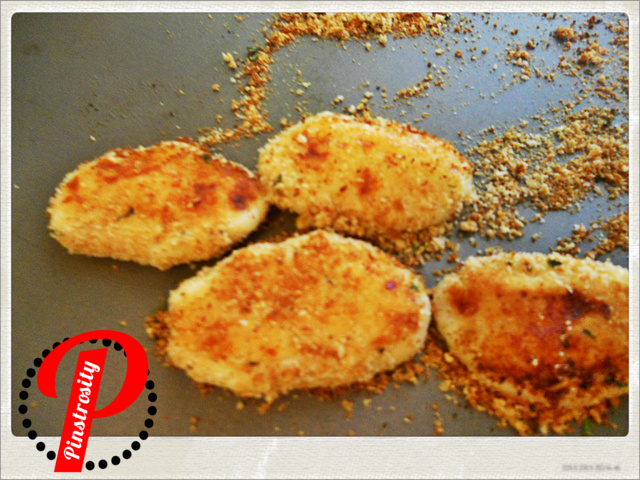 double breaded them and they were in the freezer for about 3o minutes right before cooking. I baked about 6-8 minutes and they were perfect. I had a recipe for something similar to these but I can't remember the exact cooking time or temp. The directions were to dip them in egg substitute and then panko bread crumbs and they turned out delicious! I have tried this Pin, and had the Pinstrosity result! The breading wasn't really cooked either, and even freezing the cheese first didn't work. 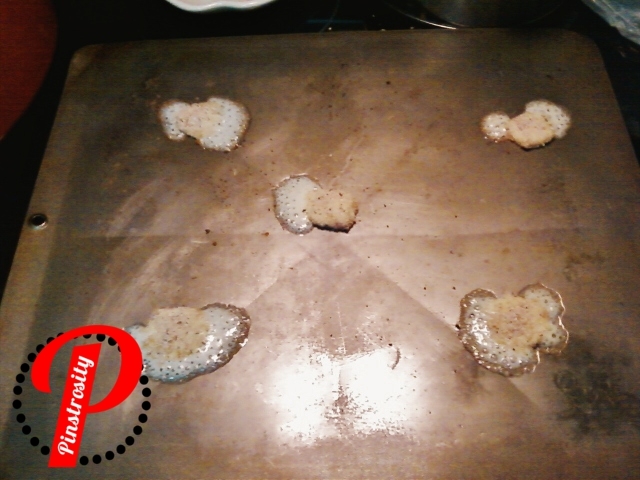 After about 3 minutes in the oven they began to puddle. I probably should try different versions to find one that works, but it still made me laugh. I've also tried this recipe with the same Pinstrosity result. I think where I went wrong was following the pinner's instructions instead of going to the website AND looking at the original recipe and the comments. The comments had suggestions from the blogger. I see another commentor hit on something *I* would have done. Whenever you bake a "fried" food...you need SOME kind of oil on the crumbs...otherwise the DRY bread crumbs just get drier. I don't use cooking spray, I have a pump doohickey that I use to spray olive oil on things...And the cheese balls should get a decent coat (not too wet) before heading in to the oven. I have *never* been able to just bake a breaded item that came out crispy (with cooked breading) unless I used oil on them first! The REAL trick to these is freezing the string cheese after cutting into cubes. 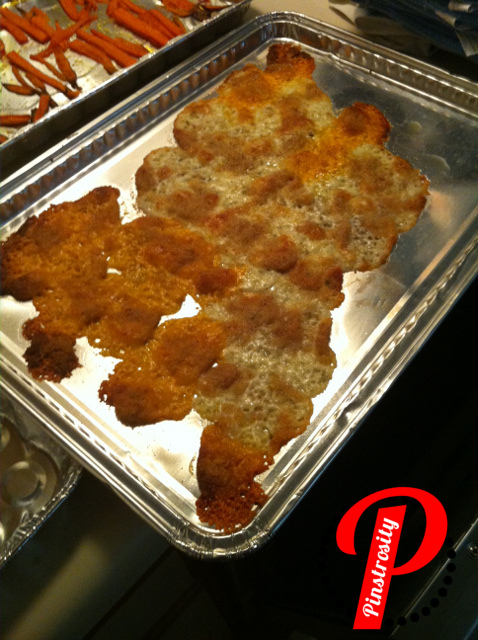 That way, the breading can cook to a crisp without over melting the cheese. Wow, first the Pintester and now here are my cheeseballs on Pinstrosity! Not sure that's a good thing though, haha! It's amazing how some people have great results and others have pinstrosities with this recipe. This was posted a couple years ago and it's by far my most viewed entry...I'm glad to see in these comments that at least some of you got it to work like it works for me! I use regular Sargento string cheese. I make a whole batch up and keep them in the freezer in a ziploc so I can make a few at a time. String cheese chopped into bite size pieces, dipped in milk and bread crumbs, baked at 425 for 8-10 minutes- serve with marinara sauce! Kids will love this...AND it's baked not fried! I just made these! I totally tweaked the recipe and they turned out great! I've seen this recipe before. The difference is that you freeze the sticks or bites for 30mins before frying or baking. This will help the cheese keep its shape. Hope this helps! 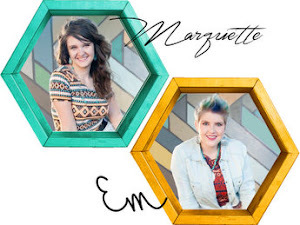 A Little MORE Encouragement For The DIY-er!